Many theater-loving volunteers are reacting with sadness and anger after learning about program cuts that Arlington County is proposing in its 2020 budget. 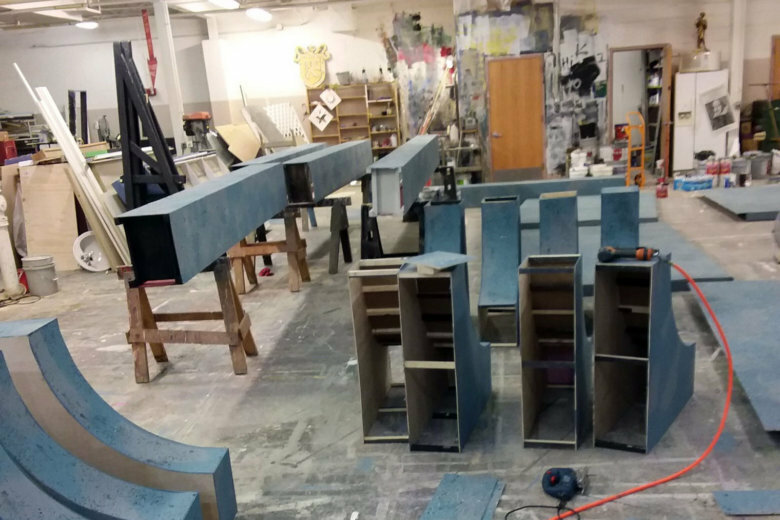 WASHINGTON — Walk into the Scenic Studio at the rear of the Gunston Middle School in Arlington, and you will see local theater volunteers with paint brushes and construction tools in hand — creating sets for community theater, children’s theater and other groups. Many of those theater-loving volunteers are reacting online with sadness and anger after learning about program cuts that Arlington County is proposing in its 2020 budget. The spending plan calls for the closure of the Scenic Studio program and Costume Lab at Gunston. The scene shop provides scenery construction space and technical assistance to community arts organizations. The Costume Lab provides costume rentals to nonprofit performing arts organizations and companies in the for-profit theater, television, and film industries. The positions of Scenic Studio manager and Costume Lab manager would be eliminated, along with that of the Facility Manager, who oversees operations of the county’s community art space on South Four Mile Run. Also on the chopping block is the position of the cultural affairs employee who manages technical staff for the South Four Mile Run facilities, Scenic Studio and joint-use spaces at Gunston and Thomas Jefferson Middle Schools, and serves as a liaison with the Department of Parks and Recreation and Arlington Public Schools, regarding venue operations in parks and schools. Some of the groups that use the Scenic Studio include The Arlington Players, Dominion Stage, Opera Nova and Encore Stage & Studio. The last group is children’s theater, in which young people not only perform on stage but are taught technical skills and scenery construction. Performances are often held in school theaters. Representatives of the groups say they’re planning to attend a public hearing on the budget on April 2 to fight the cuts. There is concern that closing the scene shop could impact the very existence of some of the community arts groups. Janet Bordeaux, who has produced four shows for The Arlington Players over the last four years, said she was shocked to learn of the county’s plans. “My biggest fear is trying to find and being able to afford a spot like the scene shop, to provide what a community theater needs,” Bordeaux said. “Particularly since they are nonprofits.” She praises community theater not only for its camaraderie, but as a way to provide affordable, quality theater to members of the community who may not be able to afford a show on Broadway or at the Kennedy Center. The Arlington Scene Shop has been in existence since the 1980s and was remodeled in 1997. It had supported a dozen groups but now is down to 5 or 6. According to the budget proposal, the Scene Shop manager, whose position would be eliminated, is responsible for operating the studio and for providing scenic design, scene painting, and other technical assistance to arts organizations, CAD programs, and other county agencies.